My children grew up watching both their parents run. And when we weren’t running, we were organizing races. But neither child took up running until recently as adults. My daughter, Olivia, began running last year. We traveled together to run her first half marathon in Disney and she is training now for the Mystic Half next month. My Son, David, is training for the Niantic Bay Tri this summer. Both of my kids and I have always enjoyed a very close relationship. And now, running is one more thread that binds us together. How blessed am I? 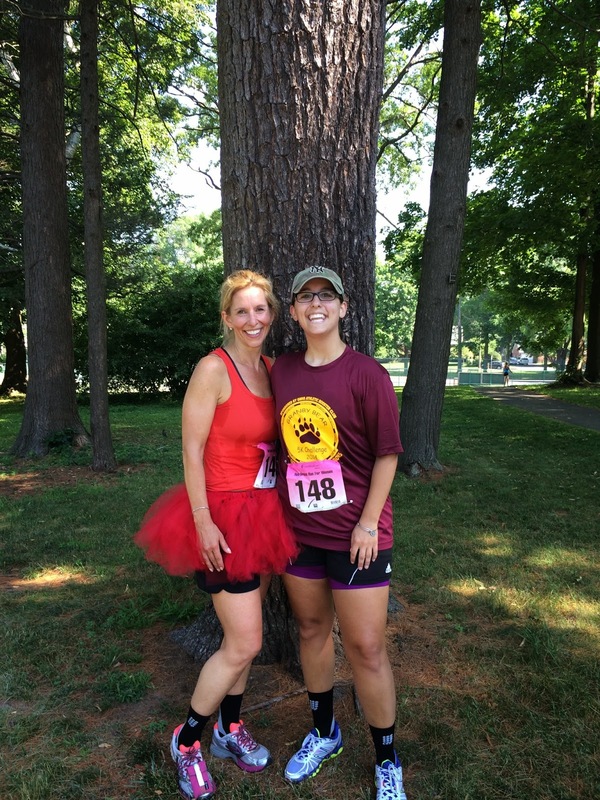 We've been inspired by our own Team HMF mother-daughter duo, Susan and Elanna Rubenstein. In their own words below, read how running together has impacted their relationship. Before becoming a mother 26 years ago, I could not have imagined I could possibly love something so tiny so much. 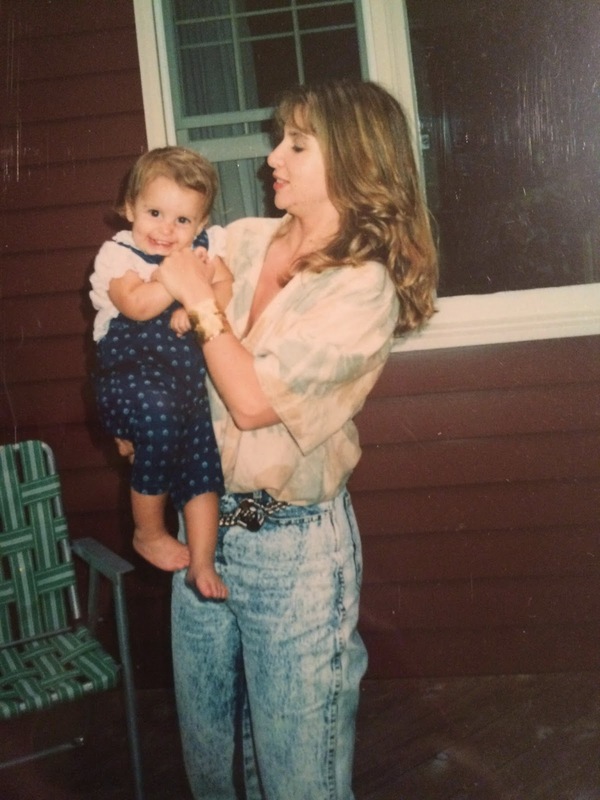 I remember the feeling - I was going to watch this beautiful baby girl take on her own journeys for years to come. During the first few months of Elanna’s life, I started to exercise, not only to lose the baby weight but to find a healthy balance in taking care of myself. One thing I discovered was running. I can’t say I was crazy about it at first; my lungs burned, I would come home from a run with swollen breasts ready for nursing, not to mention other parts of my body screaming “WHY? ?” In spite of all that, each time I ran I felt that I was taking better care of myself, and with that, hoped to be a more present and patient mother. When Elanna was 2 years old, I put her in a stroller to head out for a run (these were the days before fancy jogging strollers!). Every 1/4 mile or so, the top of the stroller would start to fold and Elanna would yell, “I’m skwooshed again!” Funny now, but I am sure it was nutty to the other runners. Eventually, I became a mother of two beautiful daughters and worked full-time. My love of running continued to grow. It became so much more to me than physical benefits. Elanna returned from college one summer wanting to get more active and decided to go out for a run. From that moment, she became hooked like I had. In 2009, we signed up for our first race. I admired Elanna’s strength, I thought of running a race as scary and nerve-racking. Hesitantly, I signed up and nervously counted the days. I cannot tell you how much Elanna filled me with support saying, “You can do this Mom”, and from that time on I did it, again and again. Because of her motivation, I signed up for race after race, then signed up for races together and a whole new relationship began to unfold. WE ARE RUNNERS. WE ARE MOTHER AND DAUGHTER. Our race days are always filled with love and laughter, but most importantly support for each other. We have traveled to races, stuffed ourselves in vans on more than a few occasions, battled snow and extreme heat, felt under the weather, experienced family crisis and more. I would never have had the courage to race if it weren’t for that beautiful little face that arrived 26 years ago. Elanna continues to inspire me everyday with her love for people, life, running and family. This year, when she encouraged me to send in an application for Team HMF I did so because she believed in me, once again. One of the best moments was when were accepted as the first ever “Mother/Daughter” ambassador team. We feel so honored and proud to show other mothers, daughters and sons how running can bring family together with a special bond. I am a runner, I am a Mom. I consider myself the luckiest daughter in the world. I have a mother who is my best friend, my support system and also my running buddy. We always start our races together and because she is faster than me, I know that I will always have my own cheering squad at the end while she waits for my finish. I never considered myself a runner; some days I still don’t, but my mom always motivates me to keep going and to keep my head up. I could finish the race. I have a hard time remembering my exact training method, but it was somewhere between thinking I was being chased and praying for a strong wind to push me to the finish. The day of the race went perfectly. I will never forget that right-turn toward the finish line in Elizabeth Park, tears were forming in my eyes and I had to catch my breath because of overwhelming emotions. My mother, my personal cheerleader and motivator was waiting for me at the finish and we celebrated our first (of many) races together. As I have grown older and hopefully wiser, I have learned that the best thing in my life was free: a mother-daughter bond. I grew up with a mother that supported me, loved me and motivated me to never settle for anything less than I deserved. I was given opportunities to go after my goals, chase my dreams and had the best cheerleader the whole way, my mom. Being picked as the first ever “Mother/Daughter” Team HMF ambassadors was something my mother and I never expected and it is truly an honor to be sharing this journey together. I started running long distances when my kids were babies. Finding the time to run all of those miles while juggling the needs of my kids, my home and the responsibilities of my full time job created stress, guilt and continuous imbalance. Ever had that feeling? Some days it all comes together and other days, well, not so much. Creating your balance may require a different mix for you than for your running buddy or for the person you cross the finish line next to. But, when the running community shares their experiences and pointers on what works for them, we can all benefit. We want to foster that info-sharing and provide access and tips on relevant topics from leading experts and top-notch sources. We want to hear from you too! Together with our partners at United Bank, we want Create Your Balance to address your needs and to share your words of wisdom. Please follow conversations on Facebook and Twitter @runHMF to learn more. United Bank is a new HMF partner with headquarters right here in Glastonbury and more than 50 branches throughout Connecticut and Massachusetts. Check out more about the great things they do for their customers and employees here! Many runners are serious about their medal collections – we’ve seen custom built displays, walls of honor and even rooms dedicated to showing off their bling. Whether it’s your first medal ever earned, the mark of a new goal attained, a remembrance of a milestone achieved or just a really cool piece of race swag, medals have reached a new status, signifying more than simply the completion of an event. Winners of the Ancient Olympic Games were awarded olive wreaths as prizes. Medal designs root back the first modern Olympic Games in 1896 but changed in 1900, when most winners received cups or trophies. At the 1897 inaugural Boston Marathon, all ten finishers were awarded a medal with the Boston Athletic Association’s signature unicorn, similar to the coveted modern-day symbol of the highly sought-after medal. What used to be reserved to long distance events has now come to be expected with all distance races, presenting a creative, and oftentimes costly, challenge to race organizers. Is an over saturation of medals diminishing the value and high regard of these once exclusive, prized possessions? Where is the line drawn on what race events provide medals and which do not? We often grapple with the decision to offer a medal to the finishers of shorter distance races when run next to longer, more challenging distances. Does offering race medals to Amica Iron Horse Half Marathon finishers and not providing bling for 10K or 5K finishers risk offending those participants? We’ve opted to provide all event participants with a relatively sized medal for their Iron Horse finish but understand there’s not one answer that everyone can agree on here. 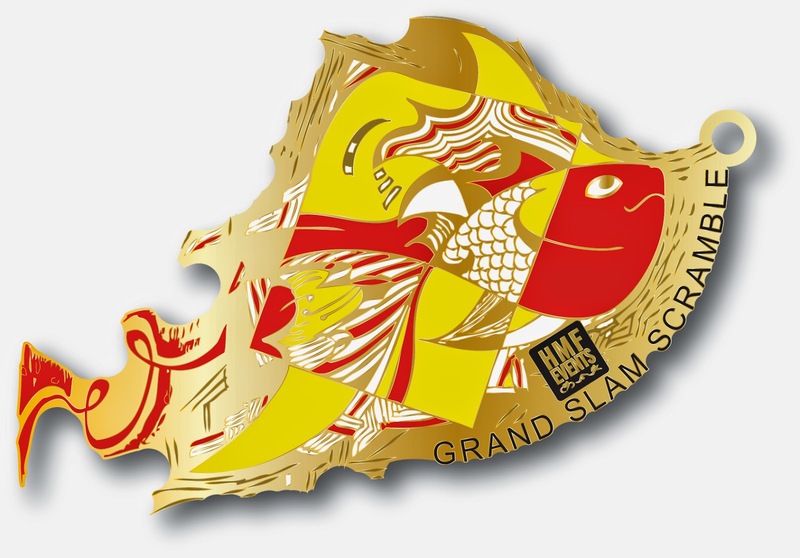 We have also created special medals to challenge participants with 5K race series – the recent O’race Trinity medal and the newly revealed Riverfront Scramble Series medals. We want to keep a competitive spirit alive with some unique offerings – the first year of our Trinity Challenge tested that concept and seems to be well-received by the community. Oftentimes, we are asked if we can provide runners an additional medal to share with an individual they are running for. Our policy is that each finisher earns one medal, simply stated. 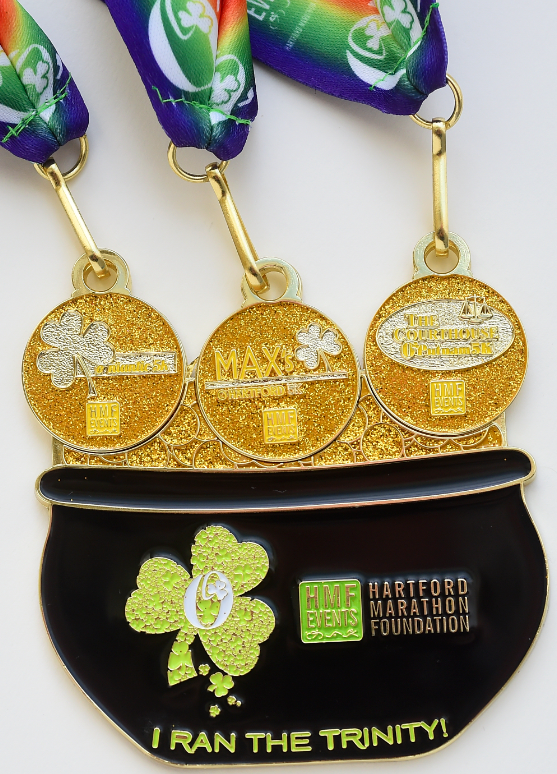 HMF fully supports our runners sharing their passion and hard-earned prize with a deserving friend, family member or designated recipient. Beyond the fact that we cannot accommodate all of these requests (and how does one determine who is more deserving? ), the medal is special and hard-earned because it was done so by the participant. Sharing the medal you earn is truly sharing your accomplishment with another. Tell us what your all-time favorite medal is and why - is it the goal accomplished or the actual bling that makes you love it the most? As a race director, I am constantly looking for ways to improve what we do for our runners. Our team strives to support the HMF community by delivering top-notch experiences, taking extra steps to provide safe, challenging, rewarding race events. When there’s question about a policy, we want to assure you that policies are set with purpose and explain why. Course limits are a reality of race management, and are relayed throughout our event communications on course pages and in final instructions. There are many factors - road permits with specific time allotments, local law enforcement staffing, medical team management, SAG staff and event volunteers have to be planned around those limits. There are a number of reasons why it’s imperative that we remove bibs from runners who decide to stay on the course beyond set limits. When the course is closed, event participation is over. While we respect a runner’s personal decision to finish a race on their own, we can’t provide support for participants past those limits. A runner on the course with a race bib signifies event participation, which is particularly concerning to local law enforcement. Even though those bibs numbers are called in to our race command, local police are not going to track our bib numbers list to ensure we’re following protocol and staying within our event permits for use of the roads. That seriously jeopardizes the approval of permits for future events. We work to account for all event participants prior to course closure - taking the bib when a runner is contacted signifies to race command that we have specifically communicated with that runner to ensure they do not need services (medical, food, transport, etc). We are responsible to make sure they understand we cannot provide services for those that continue to run the route on their own. It's really not a simple issue in any way. That said, we certainly understand that runners who finish in any time are proud of their accomplishment and want to show for it. We’ve had requests that bibs be returned to runners who finish on their own after course limits. While it would be logistically very difficult to provide their same bib/bib number, we can make sure they receive an official bib from the event. The participant needs to contact our office within a week of the event date and request a bib be sent to them, we can make that happen. We’re working hard to make your event experience memorable, and we ask that you consider there are many factors that go in to race planning and logistics. If at any time you have questions, just contact us. We’re happy to share with you how and why decisions are made and open to considering if there’s another way we can do things – sometimes there is and other times there might not be, but we can’t even try if nobody’s talking with us about it! !